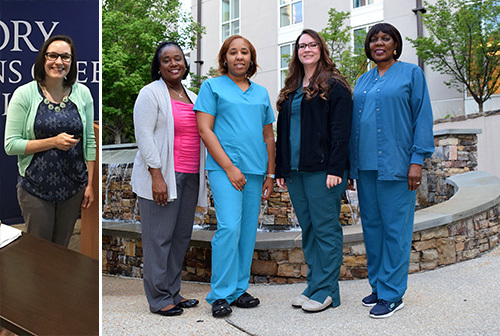 Winship nurses Ashley Rayner at Emory Johns Creek Hospital, and Zabrina Furlow, Brandi Winfrey, Ashley Morgan and Mattie Childs at Clifton campus. Thanks to generous support from the Williams Family Foundation of Thomasville and the Ginny and Garry Ferraris family of Knoxville, Winship is pleased to announce the 2017 recipients of the Sabrina Williams Oncology Nursing Education Award and the Katie Ferraris Taylor Oncology Nursing Fund Award. Each award was established to recognize and support the vital role of oncology nurses in improving the quality of life for patients and families. Brandi Winfrey, LPN, is this year's recipient of the Sabrina Williams Oncology Nursing Education Award. The award provides financial support to help health sciences majors earn undergraduate or graduate degrees. Winfrey is currently working toward her associates degree in nursing at Excelsior College. Four nurses are the recipients of the Katie Ferraris Taylor Oncology Nursing Fund Award, which provides financial assistance for professional development: Ashley Morgan, MSN, Mattie Childs, RN, OCN, Zabrina Furlow, BSN, RN, OCN, and Ashley Rayner, RN, BSN, OCN.